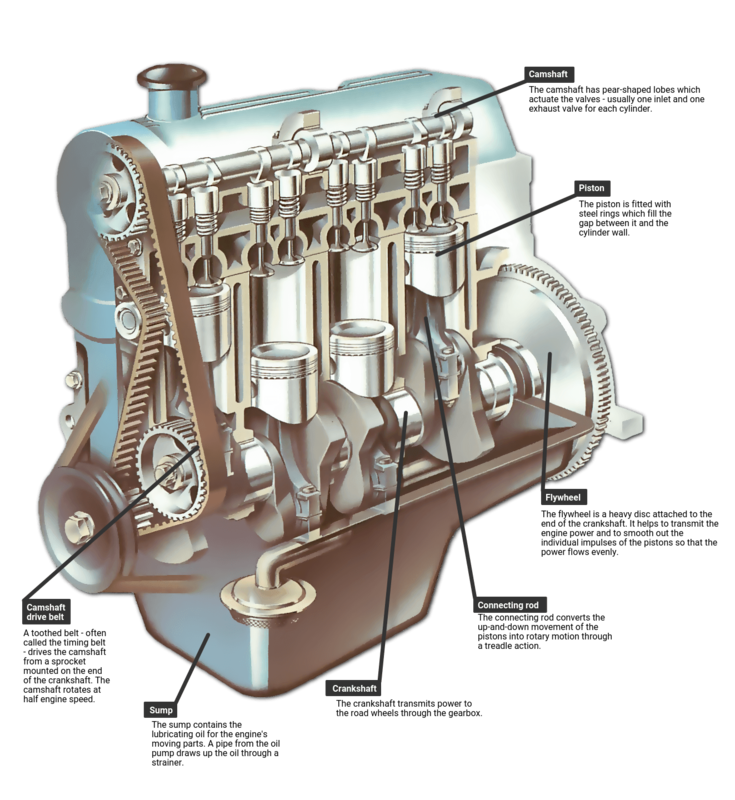 The parts of an overhead-camshaft engine Camshaft The camshaft has pear-shaped lobes whichactuate the valves - usually one inlet and oneexhaust valve for each cylinder. Piston The piston is fitted withsteel rings which fill thegap between it and thecylinder wall. Flywheel The flywheel is a heavy disc attached to the end ofthe crankshaft. It helps to transmit the enginepower and to smooth out the individual impulsesof the pistons so that the power flows evenly. Connecting rod The connecting rod converts theup-and-down movement of thepistons into rotary motion through atreadle action. Crankshaft The crankshaft transmits power to theroad wheels through the gearbox. Sump The sump contains the lubricatingoil for the engine's moving parts. Apipe from the oil pump draws up theoil through a strainer. Camshaftdrive belt A toothed belt - oftencalled the timing belt -drives the camshaftfrom a sprocketmounted on the end ofthe crankshaft. Thecamshaft rotates at halfengine speed.